Facebook is widely known for making drastic changes to its site by releasing complete overhauls (Timeline, anyone?) or adding new components like the Graph Search function. But today, Facebook announced a new kind of feature called Embedded Posts, a tool publishers and users can plug into their websites and blogs. So far, only five media websites have launched EPs - Bleacher Report, CNN, Huffington Post, Mashable and People - with Facebook stating the plugin will be available to other sites soon. This move is surprisingly late compared to the likes of YouTube, Twitter, Vine and Instagram, where you can already embed posts just about anywhere. Though, probably due to the success of these other sites, it's then not surprising the social media giant would reach out its tentacles into the rest of the public sphere . 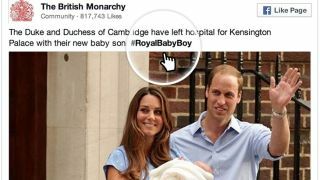 Users will be able to embed public (and only public) photos, posts with hashtags, videos and other content from Facebook onto their blogs and web sites. This means lots of interaction as people can click on the hashtags and even like the page directly from the Embedded Post. To embed a post yourself, simply hover the audience selector (a globe icon) to make sure the post is public and then click to view the dropdown menu where you'll see "Embed Post." You will notice a dialog box with the code to embed your post pop up; copy and paste the code to your site in the place where you want it to show up, and voilà, you're done - Facebook is now on your page. If changes are made to the post, it will no longer display properly and instead, a message saying the post is no longer available will take its place. Additionally, the size of Embedded Posts cannot be customized and will display as the same size seen on Facebook. This little Embedded Posts feature is sure to be a big hit considering Facebook has more than 1.1 billion monthly users. Which site is next? Tumblr, we're looking at you. Social media in the media shouldn't be a surprise as Facebook's been making waves lately, and so has Twitter.